A bowl of steaming pho on the sidewalk just a block away costs less than half the price of an English breakfast, 80,000 dong ($3.79), at The Kafe. The menu at The Kafe, prepared by an Australian chef, also features banana pancakes with mulled wine sauce. Who can pass that up even if it is $3.60? It’s Saturday afternoon at The Kafe and there isn’t an empty seat. You could be in Brooklyn or Bangkok. But this is Dien Bien Phu street in Hanoi, Vietnam. Trendy restaurants are riding a wave in Vietnam. Its young urban middle and professional classes are finding different cuisines and consumer goods more accessible ― and are eager to try them. The youngish clientele at The Kafe chats over lattes in an organic, almost minimalist, setting. Opened just last year, it is a place to “check in” on Facebook, and snap a selfie with your friends or with your toasted brioche. Just a month ago down in Ho Chi Minh City, still often referred to by its old name, Saigon, the country’s first McDonald’s served 20,000 customers in just its first two days of operations. 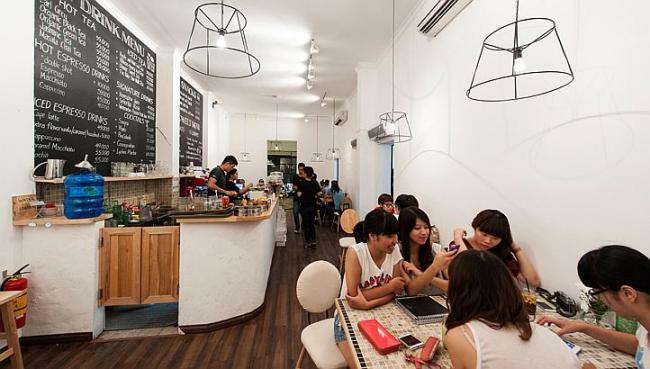 Chi Anh Dao, a 30-year-old National University of Singapore graduate and food blogger-entrepreneur who opened The Kafe last August, said: “The second middle-class generation ― people between the ages of 18 and 24 ― is becoming hungry for new things. Anheuser-Busch InBev, the world’s largest brewery, is expected to start operations in Vietnam this year. Dairy Queen has just opened its first branch, and wants to open 60 in the next five years. While food choices best reflect the new eclectic and global mindset of young consumers, it is not only food that indicates the arrival of the Vietnamese consumer. According to Singapore-based research firm GfK Asia, smartphone sales in Vietnam went up 156 percent last year. GfK’s research also shows that in the first six months of last year, more than 206,000 tablets were sold― a 233 percent jump over the same period in the previous year. This means consumers had spent a total of $94 million on tablet purchases in the first half of last year, the company said in a research note. And in a country where credit card use is still relatively low, research by Visa Card has concluded that up to 9.5 million people may be ripe for credit card companies to tap them. Vietnam had been isolated for decades, its people spending “most of the 20th century in deprivation,” as City University of Hong Kong’s professor Jonathan London puts it. The Vietnam War from 1959 to 1975 had been preceded by decades of fighting against Japanese invaders and French colonial occupiers. Vietnam’s communist government began embracing a market economy only in 1986. But the stability and steady economic growth since then have produced a middle class that now see an array of options before them, professor London said. The role of social media is an essential part of this phenomenon. For consumers, there is a “prestige factor” in going for global brands, he said. McDonald’s arrival, and its popularity, is seen as the final seal of approval on the U.S.-Vietnam rapprochement, 39 years after the Vietnam War ended with the signature of the superpower’s failure ― the helicopter evacuation from the roof of the U.S. Embassy in the same city on April 29, 1975. McDonald’s wants to open 100 restaurants across the country in the next 10 years. A sign for its second outlet, on Hanoi’s busy Pham Ngu Lao, was the backdrop for many selfies during the recent Tet, the Vietnamese New Year holidays. Burger King opened its first restaurant in Vietnam in Ho Chi Minh City in December 2011 and now has 29 branches around the country. Starbucks opened its first outlet in Ho Chi Minh City in February last year and now has three in the city. The coffee chain opened with care, deferring with respect to Vietnam’s own entrenched coffee culture. That indicates the limits to marketing by foreign brands in Vietnam, where local food has its own strong identity. Iconic global brands do not have the field to themselves. Local businesses like The Kafe, and the restaurant chain Wrap and Roll ― which serves quality food in trendy settings at reasonable prices ― are doing very well. And that pho on the sidewalk is still cheap, hot, steamy and served even faster than a $2.85 Big Mac. Consuming Western fast food would be something for special occasions, said Canadian professional chef Cameron Stauch, a resident of Hanoi. “The euphoria is because it is something new. Affordability is still an issue. Going to places like McDonald’s and Burger King would be for special occasions with the children.